Take National Freeway No.1 and exit at Jianguo Interchange, turn right, drive down the road and arrive at the Hotel at Linsen Rd. turn right, drive down the road and turn right again at Linsen Rd. After driving across Bade Rd. and seeing Dashun Chinese Medicine Clinic (大順中醫), turn left and arrive at the outdoor car park of our hotel. Take National Freeway No.3, and connect to Expressway No.88. then to National Freeway No.1 and exit at Zhongzheng Interchange, turn left, drive down the road and turn right at Linsen Rd. After driving across Bade Rd. and seeing Dashun Chinese Medicine Clinic (大順中醫), turn left and arrive at the outdoor car park of our hotel. 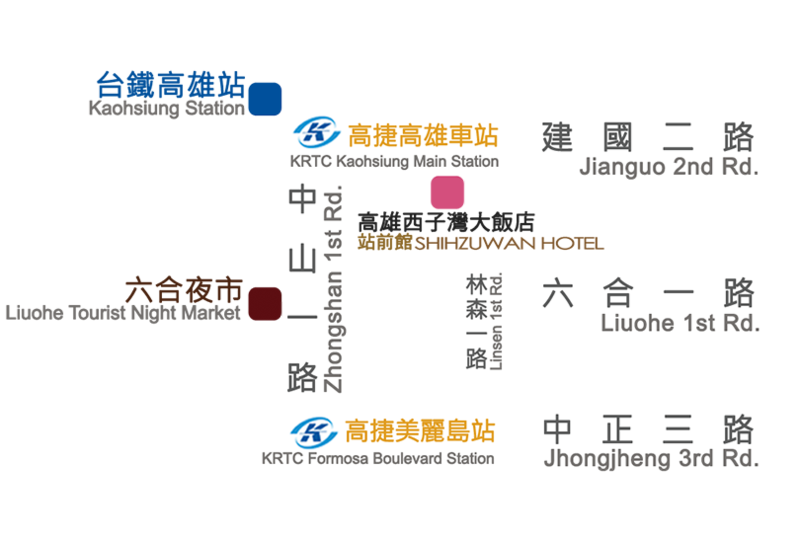 Guests can take local bus, long-distance bus, train, and MRT to the front entrance of Kaohsiung Station. © 2018 Shihzuwan Hotel Kaohsiung-Br. Station- All rights reserved.